AMU Application Form 2019: Aligarh Muslim University will conduct the entrance exam for various courses offered by the university. The university will release the AMU Registration Form through online mode on its official portal only. Aspirants seeking admission to the undergraduate, postgraduate or diploma programme can apply online. 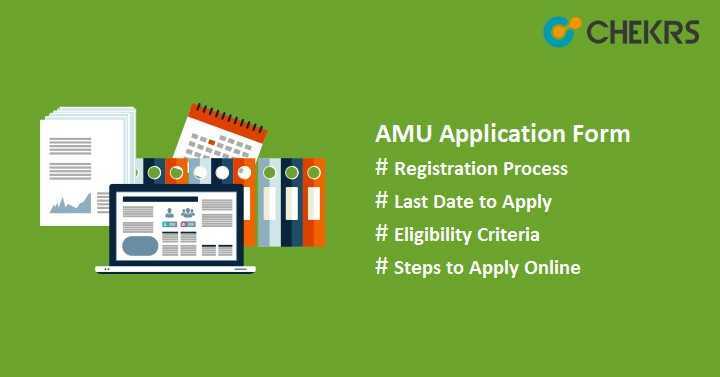 Here we have mentioned all the important details related to the AMU 2019 Entrance Exam Application Form. Kindly go through the tentative exam dates of AMU Entrance Exam 2019. Check here AMU Admission Criteria published by AMU for admission procedure for academic session 2019-20. Must have completed Senior Secondary Education with at least 50% aggregate marks in Science, Mathematics & English subjects together. Candidates who have certification in Diploma in engineering can also apply. Candidates who born on or before 1 July, 1997 can apply for AMU admission 2019. Should have bachelor’s degree with minimum 50% marks in aggregate from any recognized university / institutes. Should have passed bachelor’s degree from any recognized university or colleges in Science stream with a minimum 55% aggregate. Should have completed graduation in Engineering, Medicine and Pharmacy with at least 55% marks. Should have completed 12th from commerce stream for BCom. For BSc, must have passing certification of class 12 in Science stream and for BA, candidates must pass class 12 in arts stream with minimum 50% marks from any board. Here we have listed some required documents that are to be uploaded while filling the application form. These documents should be scanned and kept ready before filling the form. All listed AMU Admission Documents must be uploaded in jpg/ jpeg format and the file size should be between 200KB to 2 MB. Scanned copy of Candidate’s Birth Certificate or Class 10th Passing Certificate. Scanned copy of Mark sheets of the qualifying examination. Scanned copy of Caste Certificate (if required). Scanned copy of No Objection Certificate from the employer, if employed at present. Visit the official page of AMU. Select “General Admission 2019-20” and click over it. Click on option “Application Forms/ guide To Admissions”. Then click on “Application Forms – Test Courses”. Click on “Click Here” link provided there. Enter the required details like candidate’s name, set password, mail id and mobile no etc. and then submit it. After successful registration, sign in to the registered account with the username and password. Signing to the registered account will redirect to the application form page. Fill the all important details like personal details of candidates, parent’s details, address, academic qualification etc. Select test centers and then proceed to next step by clicking on “Save & Continue” button. Next step is to upload the all scanned images & required documents. Click on “Upload” button to upload the photograph, signature & thumb impression in the specified format given in the above table. Students also upload the relevant documents according to the prescribed format and then proceed to the next step. Final step is to pay the application fee. Select the course for which you want to apply. After selecting the course, it will show the course fee. The Application fee can be submitted through payment gateway via net banking, Credit or Debit card. After submitting the examination fee, submit the filled-up application form. Candidates can check the given below table for the examination fee. After filling the AMU 2019 Application Form, you will search for Syllabus and preparation meterial, Don’t Worry we have published an article about AMU Syllabus 2019 recently.